"दुनिया के लाभ के लिए"
↑ (2014) Distribución territorial y migración interna en Panamá: Censo 2010. INEC, पृ॰ 2. (Report). Retrieved December 22, 2015. 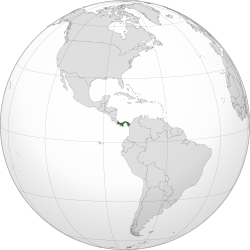 ↑ अ आ इ ई "World Economic Outlook Database: Panama". International Monetary Fund. 1 October 2017. अभिगमन तिथि March 20, 2018. ↑ "Gini Index". World Bank. अभिगमन तिथि November 2, 2017. ↑ "2015 Human Development Report" (PDF). United Nations Development Programme. 2015. अभिगमन तिथि December 15, 2015. ↑ "CIA – The World Factbook". Cia.gov. ↑ "Separación de Panamá: la historia desconocida". banrepcultural.org. अभिगमन तिथि April 9, 2016. ↑ "The 1903 Treaty and Qualified Independence". US Library of Congress. 2009. अभिगमन तिथि May 1, 2009. ↑ "Panamá: el último año". banrepcultural.org. अभिगमन तिथि April 9, 2016. ↑ Pizzurno Gelós, Patricia and Celestino Andrés Araúz (1996) Estudios sobre el Panamá Republicano (1903–1989). Colombia: Manfer S.A.
↑ International, United Press. "PANAMA LEADER KILLED IN CRASH IN BAD WEATHER" (अंग्रेज़ी में). अभिगमन तिथि 2018-06-01. ↑ New York Times. A Transcript of President Bush's Address on the Decision to Use Force, December 21, 1989. Web. January 2, 2008. ↑ John Pike. "Operation Just Cause". अभिगमन तिथि October 25, 2014. ↑ Times, Larry Rohter and Special To the New York. "Panama and U.S. Strive To Settle on Death Toll" (अंग्रेज़ी में). अभिगमन तिथि 2018-04-15. ↑ "The online almanac of Panama culture with travel links". Panama Culture. अभिगमन तिथि December 23, 2010.